What’s parenting got to do with raising a healthy eater? Everything. 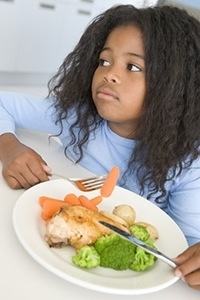 Now, that’s not to say that kids become picky eaters because of “bad” parenting. When I teach classes around the United States, the audience learns that kids with serious feeding challenges got there because something went awry with their physiology, sensory or motor development, and consequently, children quickly learn to limit what they’ll eat. For example, an infant with severe gastroesophageal reflux (chronic heartburn is one symptom) learns to avoid breast or bottle-feeding until their hunger pangs override the heartburn. They’ll typically only consume about two ounces and will often stop abruptly once the pain of eating is greater than the hunger. Treating the discomfort with medication doesn’t always resolve the feeding challenges, however, because the child needs to “unlearn” the lesson that eating hurts. From infants to toddlers to older children, learning to be an adventurous eater is rooted in trusting that food will be a pleasurable experience. A trusting relationship between parent and child is an essential part of the process – and that’s good parenting. For parents of “picky eaters” who are worried about their child’s nutritional health, it’s easy to make mistakes by over-praising or cheerleading their kids through mealtimes. 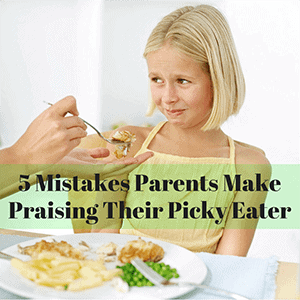 Parents are often fluent in “awesome” and “good job” but hesitant eaters don’t really trust those overused phrases. The child thinks quietly to himself, “Mom says that all the time” and it really doesn’t make much of an impact. 1. “It’s YUMMY!” Sure, we all probably say words like “delicious” or “tasty” several times a day. But for the child who isn’t keen on trying new foods, these descriptors lack substance. The hesitant eater may not trust that the first taste will indeed be “yummy” and just hearing you say it in the most convincing tone isn’t going to sway her into biting into that Brussels sprout. 2. “Good Job Breathing!” If your child didn’t do anything to earn it, don’t comment on it. I run into this whether it’s an 8-month-old who drinks their entire bottle or a sixteen month-old who becomes a member of the empty plate club. The parent exclaims, “You finished it ALL GONE!” Well-meaning parents may be trying to teach the concept of “empty” or “done” but are inadvertently praising a child for something that frankly, just happened because they were really hungry. Soon, even 1-year-olds learn to eat more than they need because Mommy and Daddy praised them into it. It’s most important that kids learn to tune into their own body signals, like the sensation of fullness. Let them decide if they need to eat more. 3. “Why Kids Hate the Teacher’s Pet…unless it’s them.” Kids will live up to the labels we assign to them and when we repeatedly praise a sibling or friend for being “an adventurous eater” in front of a hesitant eater, we are essentially telling him “and you’re not.” On the flip side, referring to a child as “the picky eater in the family” is like hanging a blinking neon sign above his head that reads “PICKY FOREVER” for the entire community to notice. Consequently, neighbors always serve macaroni and cheese when your picky eater visits because they know he’ll eat that. The same pizza gets ordered for class parties because several of the kids are known picky eaters. Specific restaurants are the dinner spot of choice, thanks to the same old kids’ menu. In our new book, Raising a Healthy Happy Eater, written with pediatrician Dr. Nimali Fernando (Dr. Yum), we suggest calling everyone in the family “food explorers” with the understanding that everyone has a different comfort zone when it comes to trying new things. Over time, they’ll broaden that zone to include more and more foods. But expanding that comfort zone is always about exposing kids to new opportunities to explore new foods and that includes friends’ homes, school and restaurants. 4. “Your brother likes to eat broccoli…” This sort of round-about comparison is about as subtle as saying to your spouse “My first husband loved to vacuum…” and expecting him to rush to the nearest Hoover and plug it in. Feeding specialist Melanie Potock, MA, CCC-SLP and pediatrician Nimali Fernando, MD, MPH are the co-authors of Raising a Healthy, Happy Eater: A Stage by Stage Guide to Setting Your Child on the Path to Adventurous Eating (Oct. 2015) and the creators of ParentingInTheKitchen.com, where you can sign up for their newsletter offering more tips on kids, food and parenting in the kitchen.